I have had friends who wouldn’t invite me for dinner because they thought I was a better cook then they are. Actually, I really adore it when someone cooks for me. I don’t care if it’s perfect. Cooking for someone is an act of love and I love to be pampered. Don’t we all do? Make me a fried egg, please, I’ll love you for anything you cook for me. There’s another fact. I hate to be a pain in the neck when someone invites me for a meal. However, I have all sorts of food intolerances. They even change with the time which is quite confusing for hosts who think they know my problems. I’ve been dairy free for 10 years. Now I can have dairy in moderate amounts but I can’t have wheat. This recipe is a life saver for modern stomachs and desperate cooks. Not only it can be prepared in advance. It can also be made vegetarian by skipping the ham and gluten-free by substituting the flour. For the gluten-free version I use my GF cake-flour mix which works fantastic. In fact you don’t even know there’s no wheat. 300 gr (2/3 lb) blanched spinach, excess moisture removed by squeezing. For the crêpes, mix the liquid butter, eggs and milk in a bowl. Add flour, salt, nutmeg and whisk. Brush a 15 cm/6 inch , non-stick frying pan with melted butter and set over medium heat. Pour a small ladleful of the batter (about 3 tablespoon) in the pan and swirl to make the thinnest possible pancake. Cook for 1-2 minutes each side then remove and set aside. Repeat, to make 14-15 pancakes. I only butter the pan once at the beginning. In a separate pan, heat the garlic briefly in 1 tablespoon extra virgin olive oil, add the cooked spinach, salt lightly and warm through to infuse with the garlicky oil. Transfer in a food processor together with ricotta, the ham and two tablespoons Parmesan. Process briefly until smooth. 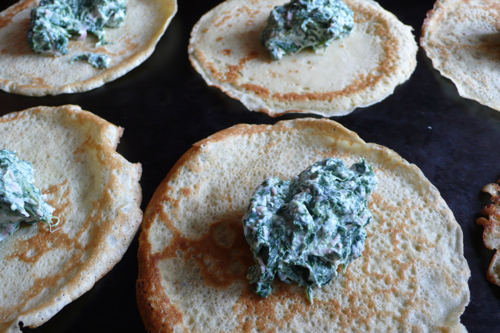 Distribute the spinach mixture in the centre of each pancake. Spread filling all over the pancake then roll like cannelloni. Place in the baking dish. 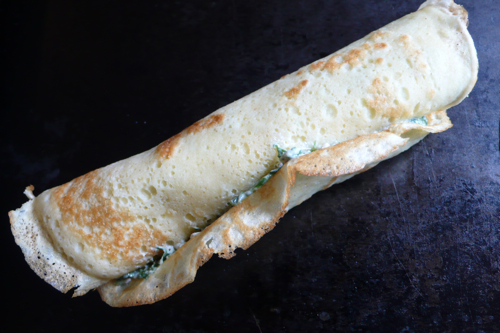 Spread crepes with Bechamel and sprinkle with two more tablespoon of Parmesan. Bake for 10-15 minutes until golden and bubbly. Serve hot. These sound so wonderful and remind me of a chickpea crespelle I once had in Italy. What a nice light supper they will make! Hi David, indeed you could use garbanzo flour in the gluten free mixture. So far an flours I used works wonderfully wel with this recipe! Just love your recipes, including this one. Thank you so much. Can’t wait to try this. thank you so much, do let me know if you like it! Hi Letizia, I read a while back that you were going to buy a magimix food processor. Did you ever get one? Do you like it? Where did you buy it in Umbria. I know this is an odd comment for your post but I found out about your processor shopping via the internet and was wondering what you did. Hi Michelle, the Magimix has been a disaster. May be I got a piece which was made on a Monday. Local service was a disaster, they did not want to fix it even though was brand new. It’s now in a box. With a new motor but the central axe stuck in the beaker due to malfunctioning of the nylon spindle. So sad. I would defintely not recommend it, I went back to my old Rowenta which is less fancy but still works well after years of daily use. I have a magimix and it really is brilliant. You must have bought a defective one. I am looking forward to trying your spinach and ricotta crepes. Yes I did buy a defective one but the most frustrating thing was tha the local assistance was completely useless! I hope you like the crepes, I just made them again a few days ago! I just got back from a trip to Italy and immediately started looking for this recipe. I had a wonderful meal while in Florence that seems very similar to the recipe you described above. The only difference is the restaurant used both a red sauce and bechamel. Do you know if this a typical meal in the Florence region? Hi Jeri, crespelle are served all over Italy in various ways, with white sauce only, with tomato sauce or with a combination of the two. If you liked it with tomato you could use my basic recipe here . Just make sure to make the crespelle very thin! lovely, let me know if it works out! Please would you send me instructions on how to order your cookery book. It sounds great fun! Hi Mary, I have just sent you an email with all info! Thanks for asking! I tried your recipe but had no time for the white sauce. I think it was a mistake and I’ll make it next time. The dinner was delicious. My picky eater wife loved them. Just now I have left over chili. I mixed it with Ricotta, 50/50. I’ve put some tomato sauce over the top and baked 15 minutes at 350 F. The results are spectacular! good to know thatit worked even without bechamel. It is actually very quick to make if you follow my microwave recipe Mark. ENjoy!